1 of 3 Heat oven to 350 degrees . Line 18 indents in two cupcake pans with paper or foil liners. In a bowl, whisk flour, cocoa powder, baking powder and salt. 2 of 3 Beat butter and sugar in large bowl for 2 minutes, until light colored and smooth. Add eggs, one at a time, beating well after each. On low speed, add flour mixture, alternately with milk. Divide batter among liners, a scant 1/3 cup in each. 3 of 3 Bake at 350 degrees for about 19 minutes or until toothpick inserted into centers comes out clean. Remove cupcakes to a rack; cool completely. 1 of 1 Beat confectioners' sugar, butter and milk in medium-size bowl until smooth. Beat in vanilla. Tint with desired food colors. 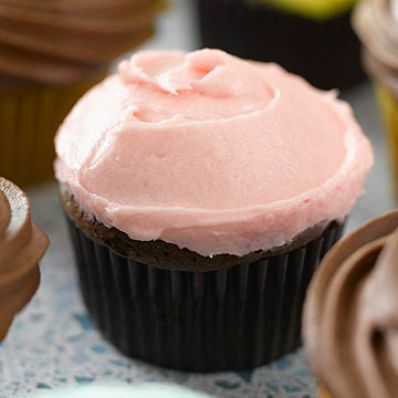 Spread about 2 tablespoons frosting over each cupcake.